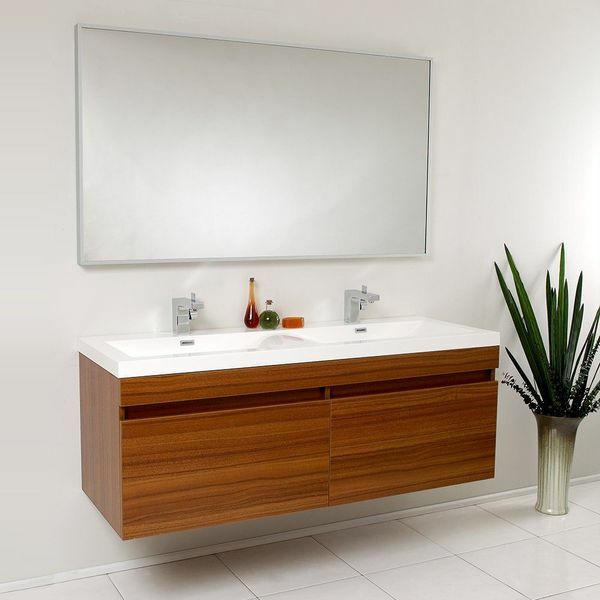 Ideal for a crowded bathroom floor plan, the Fresca Pulito Small Teak Modern Bathroom Vanity with Tall Mirror uses available wall space to mount a petite rectangular white acrylic sink. This handsome teak wood vanity has a single cabinet finished with an aluminum bar handle, and the included mirror has a matching aluminum frame. 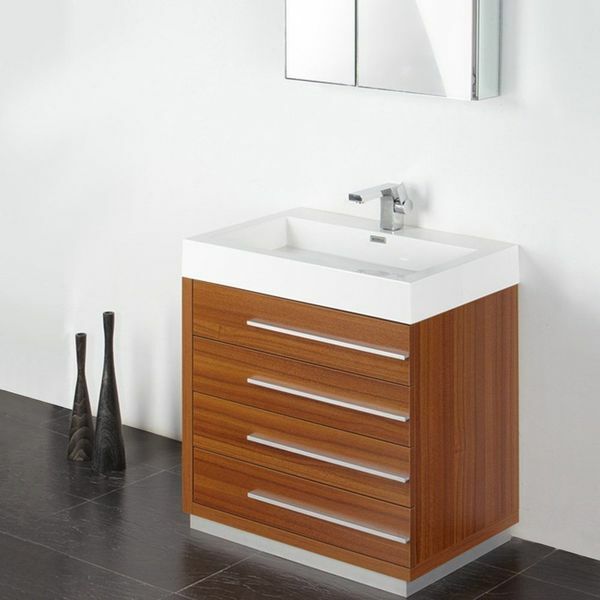 The Fresca Largo Teak Modern Bathroom Vanity with Wavy Double Sinks brings modernity to the bathroom with its elegant white acrylic counter top and pair of rectangular sink basins. Exquisite teak finished wood complements the clean lines of the top. The vanity has two doors with recessed handles and comes with a matching two-door medicine cabinet. 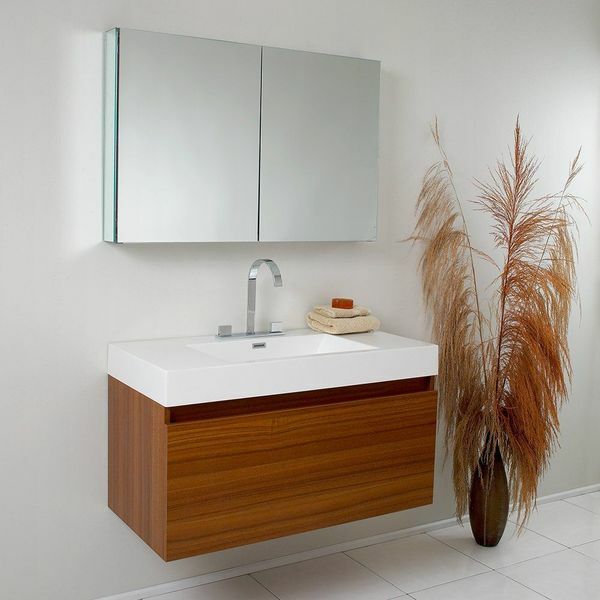 Blending light wooden tones and crisp white hues, the Fresca Vista 48″ Teak Wall Hung Double Sink Modern Bathroom Vanity is a gorgeous modern vanity that can instantly upgrade any bathroom. The acrylic vanity top features two square sinks that rest on the brown cabinet, which includes three cabinet doors with soft-closures . 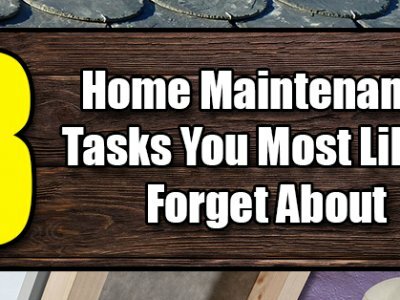 A wall-hung medicine cabinet completes the vanity set. 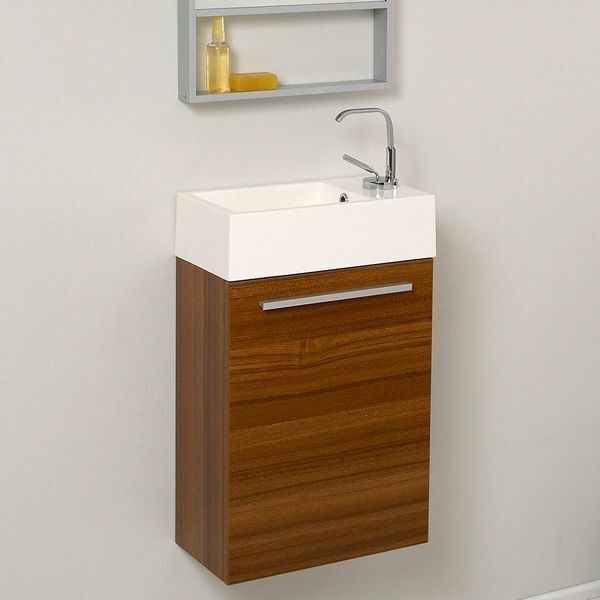 The Fresca Mezzo Teak Modern Bathroom Vanity with Blum Storage System lets you completely decorate the sink area of a small master bathroom, guest bathroom or powder room in the utmost of style. The vanity design includes a single storage area, a white acrylic sink and a chromed brass faucet. A gleaming double door medicine cabinet comes with the set. 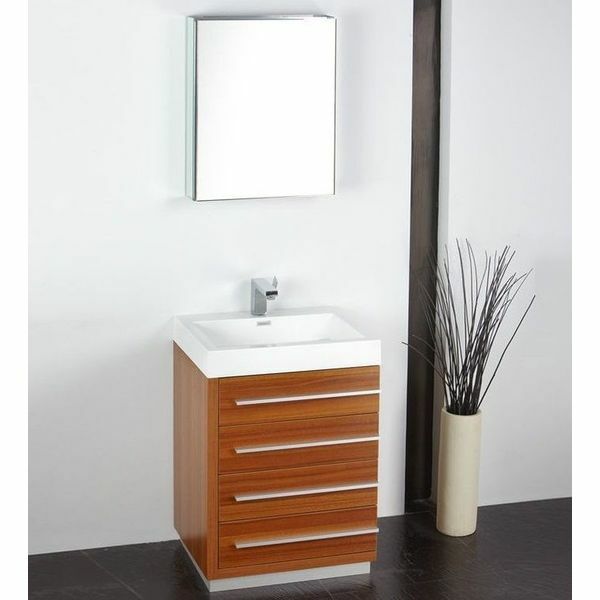 Sleek chromed brass and richly grained teak wood veneers make the Fresca Livello 30″ Teak Modern Bathroom Vanity with Faucet & Medicine Cabinet a stunning modern piece for a contemporary bathroom. A large rectangular white acrylic sink tops off the vanity, and the brass faucet has a matching chromed finish. 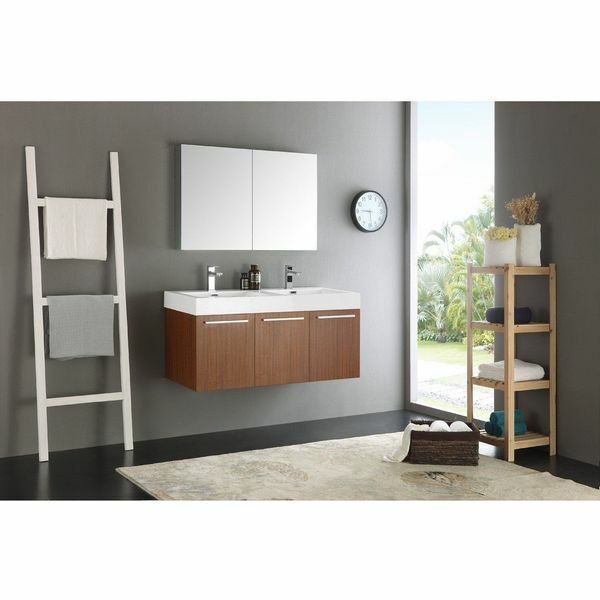 Bring a clean, modern look to a bathroom and make the most of a small space with the slim, stylish lines of the Fresca Senza 24″ Livello Modern Teak Bathroom Vanity Set with Medicine Cabinet. This complete set includes the medicine cabinet, the white acrylic basin and the chrome-finished brass faucet.